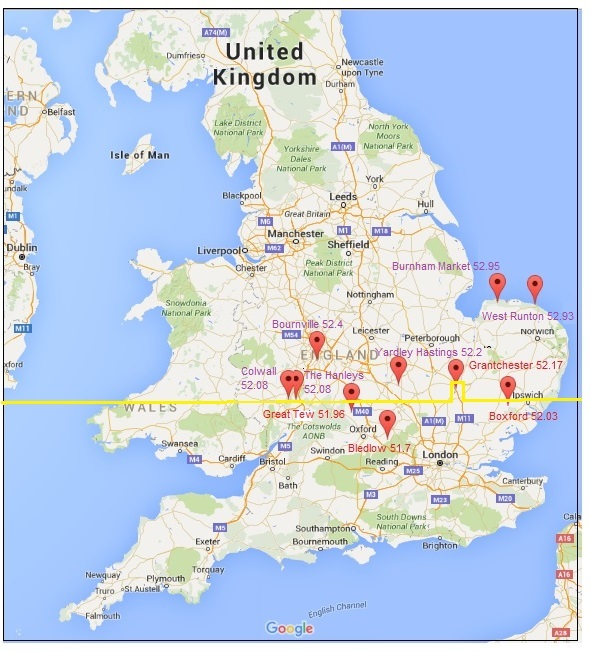 The yellow line shows the North-South divide in Timesland. Where does the North begin? Sheffield? Nottingham? Watford Gap? Not if you write for The Times. Over the past few days a series of puffs for "the best place to live" have turned up on Facebook. Friday's Bricks and Mortar supplement focused on the best market towns, but earlier in the week the website looked at "the 20 best villages in the south" and "the 20 best northern villages". If you want to live in a chocolate box constantly harassed by people peeking through your windows in search of a hazelnut praline or if you have a hankering to rub shoulders with a D-lister in the pub, then these are as good a guide as any. But where they really excel is as an example of vacuous metropolitan journalism on the cheap. According to this, the Midlands don't exist and the North starts around latitude 52, just above the Cotswolds. It apparently encompasses everything from South Wales and East Anglia to the Shetlands. It includes the villages of West Runton and Burnham Market in Norfolk, Colwall and the Hanleys in Hereford and Worcester, Yardley Hastings in Northamptonshire, and Bournville in Birmingham. Grantchester near Cambridge is, however, in the South - even though at 52.17 it is marginally further north than the Hanleys and Colwall. Others narrowly missing being cast off with the grim crew Up North include Great Tew in Oxfordshire (51.96), Bledlow in Buckinghamshire (51.7) and Boxford, Suffolk (52.03). It's absurd, of course. It shows a lack of geographical knowledge and a Londoncentric mindset. Geography aside, what are the plus points for the featured villages? Top of the pops is Pittenweem in Fife, which has "craft boutiques, a smart chocolate cafe and the obligatory fish and chip shop". Cartmel in Cumbria (3rd) is the birthplace of sticky toffee pudding and has a Michelin-star restaurant. Plockton in the Highlands (6th) was the location for The Wicker Man and has a post office and an award-winnning gastropub. Burnham Market (8th) is known as Chelsea-on-Sea, has chic boutiques, a beauty spa in the pub and is home to Johnny Depp (maybe), Bill Bryson, Amanda Holden and John Hurt. The Red Lion in Yardley Hastings (18th) holds quiz nights. Well you don't find those everywhere. And what's "best of all" about Bournville (12th)? "It's only 12 minutes from Birmingham New Street and conveniently situated between the M5 and M42." So you can escape back to civilisation, ie a city. Back in the real world of the South, top billing goes to the Sibfords in Oxfordshire, which is less than an hour from London by train, has the best doctor's surgery in the county, and independent schools close to hand. Tisbury in Wiltshire, which comes in second, is "popular with senior army officers who can leave their families while they're away". What? Further down the league come villages that are home to Valerie Singleton, Harry Enfield, the Stig and Mel C and some that were used as film locations. Most have pubs, some have fetes. It's quite extraordinary. Goodness knows what the point is of all this. The Sunday Times's property supplement has today published part two of its "best places to live" feature, so maybe it's supposed to tie in with that. But the ST - which awarded its crown to Winchester - did at least go into some detail and even explain its methodology and criteria. The Times's stuff is a sub-local paper googlefest written by a ubiquitous freelancer. In picking the same old, same old pretty pretty villages, the real hidden gems remain hidden. Which is probably just the way the people who live there like it.